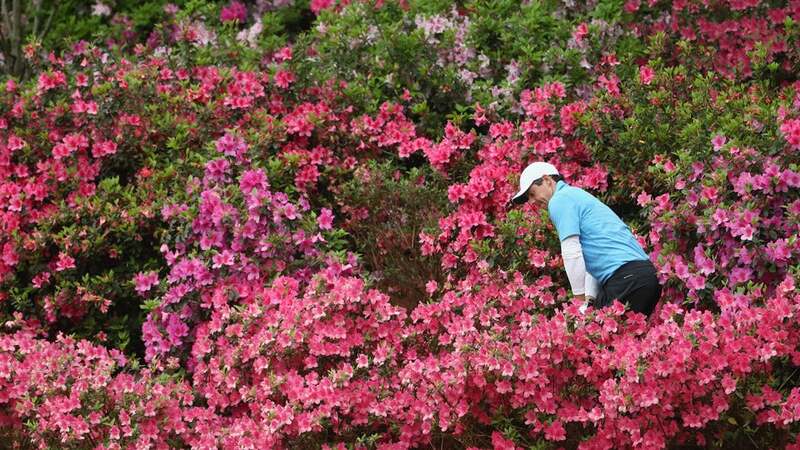 What would an average Joe shoot at Augusta National? AUGUSTA, Ga. — On Friday evening one of Rickie Fowler's Twitter followers squealed at Fowler's assertion that if you took an average weekend hacker and gifted him/her every green in regulation he still couldn't break 80 at Augusta National. "Wasn't dogging at all!" Fowler replied. "I 3 putted 13,15,16...tv does not do Augusta's greens justice especially when at tournament speed...add some wind & enjoy..." Let us take that debate a step further. Under tournament conditions, with tucked pins, roaring galleries and a steady breeze blowing through the pines, what would an average golfer — a 15-handicap, say — shoot at Augusta National? Ninety-five? One hundred? A buck ten? Worse? It's been said many times, but it's hard to appreciate the difficulty of some of the shots at ANGC until you see them for yourself. The fairway on 13 is pitched like a NASCAR track; have fun ripping a 5-wood off of that. The blind tee shot at 11 requires the precision of a heart surgeon. And the shelf on the front-right part of the 3rd green, where the hole was cut on Thursday? You'd have better luck checking up a wedge shot on your kitchen table. "A 15 handicap?" Jason Day said Saturday afternoon when I proposed the question to him. Day was coming off a snazzy four-birdie 69 but still feeling the sting of his 75 in the second round when the scoring average for the field was just a few ticks under that (74.56) and Amen Corner alone produced 22 double-bogeys. "If you're playing well and everything's going your way, you would probably be in the 90s. Mid to high 90s. But you've got to understand that you're dealing with weather conditions, you're dealing with fast, hard conditions, and if the greens are rolling at a 14, good luck. I mean, it's really, really hard. It's hard for us. I shot 75 and I feel like I played all right." Really, really hard for them, of course, means really, really, really, really, really hard for you. Oh, sure, with patrons and sharp-eyed spotters lining every hole you wouldn't lose many balls (barring a pulled approach at 11, a flared tee shot at 12 or a chunked wedge at 13 or 15), but you'd face sidehill lies that are tighter than a snare drum and greens that are slicker than an oil spill. Those three-putts you're accustomed to making at your home course? On Augusta's Himalayan greens they'd translate into four-, five- and @&%$!-putts. Like Day, Adam Hadwin carded a 75 in the difficult second round. The Canadian took a more calculated approach when I asked him about our study. "A 15 handicap? Well, you got a par of 72, so if he plays to his handicap, that's about an 87-88, so in tournament conditions, they probably don't break 100. No chance," he said. "I'd say anywhere from 100 to 105," he added. "A bad day would be 105-110." Hadwin said that many of the 15-handicappers he's played with don't struggle with ballstriking as much they do around the greens. "You can't do that out here," he said. "I've putted balls six feet away from holes [because the break is so severe]. Guys just don't see those lines unless you do it every day like we do, so they're probably going to three-putt most holes." Doug Ghim this week played Augusta National for the first time in tournament conditions. Ghim plays at the University of Texas and finished runner-up in last year's U.S. Amateur, which punched his ticket to the Masters. He hasn't shown many signs of nerves this week — with opening rounds of 72-76 he was the only amateur to make the cut — but I was still curious to hear what shot he thought would give a 15-handicapper the most trouble. He didn't skip a beat. "Fifteen," he said, in particular when the hole is cut on the left side of the green as it was on Friday. "No matter what club you have in your hand if you have an opportunity to go at the flag there's really no place that's a good spot. For a 15-handicap, he probably doesn't have the greatest touch, I'm assuming — even if he safely gets on the right side of the green, he could realistically putt it off the green and into the water." I told him one of my colleagues was bragging earlier in the week that if he had 20 balls and a wedge in his hand, he could hit that green 18 or 19 times. "The only way you'd the green 18 times is going out to the right-center of the green," Ghin said. "And even then, you saw Sergio — it's not that easy, especially when you don't know where the wind's going." Sergio, as in your defending champion, who deposited four consecutive wedge shots into the pond on 15 on Thursday. When asked to identify the shots that would most give weekend hackers the willies, Day identified the tee shot at the 1st — "If you have crowds around the opening tee shot, it's ridiculously hard," he said — and also the tee shot at the par-3 12th. "We were standing on the 12th tee yesterday," Day said of himself and his playing partners Henrik Stenson and Bubba Watson. "The wind conditions changed four times while Henrik was standing there and then I got in there. It was supposed to be off the right and it was a hurricane down off the left." Seven-iron through a hurricane to an angled green ringed by bunkers and water — you've got that shot, right? David Leadbetter, a swing coach who's worked with such bold-faced names as Nick Faldo, Greg Norman and Ernie Els but also thousands of weekend hackers, reminded me that the best sample study for my investigation would come on Monday, when a group of lottery-winning media members will take to the course. But then I reminded him that those giddy scribes will play from the members' tees, which is an entirely different proposition. "Oh, what the hell," he said, half-joking. "That's easy!" Leadbetter also singled out the third shot at 15 as a shot that would most vex a 15-handicapper but added a caveat: "In their case, it might be the fifth shot." He also flagged up the difficulty of the sidehill lies in the 13th fairway and, yes, the tee shot at 12. "But any hole could be calamitous," he said. "People don't realize how tough it is." The closest patrons can come to experiencing the course during Masters week is at Berckmans Place, a lavish entertainment complex tucked in the pines next to the 5th fairway. The main attraction at Berckmans are the slightly downsized replicas of the greens at the 7th, 14th and 16th holes, where the cups are moved each day to match that round's hole location. For cocktail-sipping patrons, the results aren't always pretty. "They can't even keep putts on those greens even after they've seen their mates knock it off," Leadbetter said. Given the number of swings Leadbetter has witnessed in his lifetime, we're giving him the final word. So, coach, what's the final tally for our fearless 15-handicapper? "One-hundred and five," he said, "but they'd have to play their boots off."